If you were to go through your kitchen spice rack, you would be amazed at just how many of the herbs and oils you have in there can be used for other things besides cooking. As well as a flavouring agent in food, thyme essential oil has also been used for centuries for its medicinal and aromatic properties. Although there are several varieties of thyme available, common thyme is the one that is most often used for aromatherapy purposes. To remove the irritant substances that are found in the plant, the essential oil is distilled twice. The herb and essential oils are used for cooking, as an antiseptic, as a digestive stimulant, as a disinfectant, as a diuretic, as a stimulant, and to help insomnia. When used in cooking, it can help preserve meat and keep it from spoiling. It slows down the growth of bacteria, keeping meat broth from spoiling for up to three days. It is also a pungent herb that retains most of its flavor even through drying, making it a quite popular ingredient in a variety of recipes and seasonings. 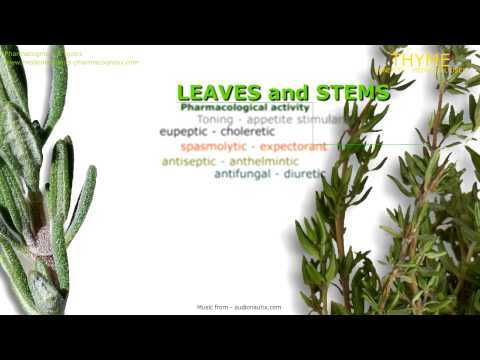 Thyme essential oil has many uses as an antiseptic. It makes a good pulmonary disinfectant, which helps with all respiratory infections including coughs, colds, and sore throats. It also helps with mouth infections, including those of the gums, and throat infections. It can be inhaled or used as a mouthwash or gargle for both purposes. When taken internally, it can help cleanse the urinary tract and infections of the bladder and urinary tract. It is also known to be a strong antiseptic and can be useful as a wash to disinfect hands. You can use thyme compresses as wound dressings as well for a natural remedy. Thyme is also known as a stimulant. It stimulates the circulatory system, and can help raise low blood pressure. For people with a slow digestive system, it can help to stimulate it, and has also found to be helpful for those who are fatigued, lethargic, or depressed. It is also thought to help memory by stimulating the chemical reactions in the brain. Taking a warm bath with thyme can help relieve insomnia and it is thought to help slow hair loss when used as a hair rinse after shampooing. Other uses include compresses for sores, rheumatic pain, insect bites and stings. For those who believe in the magical properties of aromatic herbs, thyme is believed to help guard against nightmares, and can be used in pillows for this purpose. It has been used in the past in rituals for courage or confidence, and was used in medieval times to show women who their true love was. It is also thought that by wearing a sprig of fresh thyme to a funeral you could protect yourself from the sadness of others. The ancient Greeks used thyme as an incense to help invigorate the spirit. You can get the same effects today by using thyme as incense, in sachets, or in potpourri burners. As with all essential oils, before using Thyme you should check for any allergic reaction. Put a few drops of diluted essential oil on the skin of your arm to test for any reaction. Should a rash or redness occur wash the area and discontinue use immediately. Inhaled reactions can occur as well, so if the scent of thyme essential oil causes headaches, dizziness, or other discomforts remove yourself from the room and get some fresh air until the feeling passes. It is always prudent to consult with your primary care physician before starting any essential oil treatment.